Let’s talk about getting to that second draft. For me, the hardest part of editing the first draft has been reworking the plot. The plot in my novel is quite complex, though it can be broadly split into three main sections, which I’ve been able to map out quite well (see Aristotle’s plot structure for tragedies and Freytag’s dramatic structure ). With that being said, my novel also contains many smaller emotional turns and peaks of intensity that are really hard to keep track of. This isn’t necessarily a bad thing. 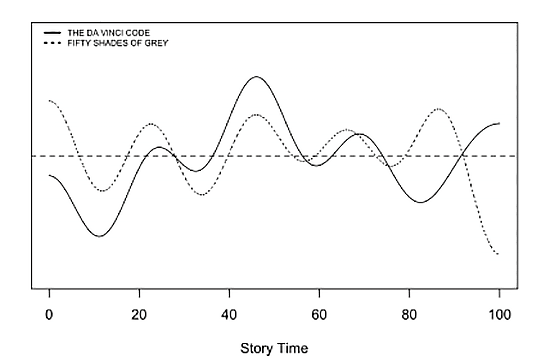 Jodie Archer and Matthew Jockers suggest a correlation between the regularity of these emotional turns and a novel’s chances of success in their book The Bestseller Code. They use two controversial successes, The Da Vinci Code by Dan Brown and 50 Shades of Grey by E. L. James (figure 1) to demonstrate, what they refer to as, the “page turner beat” (Archer & Jockers, 2017, p. 107). This plot structure is demonstrated in the graph below, with Archer and Jockers explaining that “changes in direction on the graphs roughly equate to moments of conflict and resolution. The more frequent the peaks and valleys are, the more of an emotional roller coaster for the characters and for readers” (2017, p. 89). I wrote my novel this way because I have a short attention span. However, it’s made the editing process much more complex. At the moment, I’m still working my way through the first draft and only fixing major problems, but, when I focus on the plot more closely, I’ll definitely be utilising Natasha Lester’s “what is known” chart . Lester uses the plotting chart to keep track of what is revealed to the reader in each chapter and what is kept hidden. While the plot isn’t my main focus in this edit, I have made some pretty big changes as a result of some of the research I’ve done. This has made editing later sections much more difficult. So far, the biggest changes have been in the first three chapters, which I posted about rewriting 8 weeks ago. Since then, my goal has been to finish editing the second section, which also happens to be the largest as it sets up the final act of the novel. Before I started culling lines, this section was almost 40,000 words of the original 86,000 word manuscript. It’s taken me a long time to edit as a lot has gotten in the way over the last two months. This has made be feel very unproductive, and I’ve beaten myself up over it a few times now. I wasn’t sure I’d write about this, to be honest, but I’ve been struggling a lot lately. If you’ve been reading my blog, you’ll notice the last few posts have focused on how I’ve been feeling like I’ve had too much to do. In short, I burnt myself out. I burnt myself big time, and I was recently diagnosed with anxiety and depression. I stopped doing a lot of things I previously enjoyed. When I wrote the first draft of this novel, I wasn’t thinking about the research I’d need to do. I wasn’t concerned with making sense of the plot. I was just enjoying being in my head, being in another world. “The Life took about ten weeks to do the first draft, and I remember then, too, just having this one voice in my head. It must be what having a mental illness is like, having another voice talking to you all the time, and if not talking to you, interpreting your own thoughts into its speech” (Knox as cited in Wood, n.d., para. 11 – 12). I wrote my first draft over 6 weeks and the story was all consuming. Now I need to be more critical and, for the most part, I’ve been enjoying refining what I’ve written. Lately though, the only things I’ve been able to focus on are all the negative things I keep telling myself. It’s been overwhelming. I haven’t been reading. I haven’t been watching TV. I haven’t seen any films. Nothing has distracted me for very long, and it’s taken a lot of work to be able to step back and give myself the mental space to just be me again. I finished editing the second section of my novel two weeks ago, but here’s the thing; I didn’t celebrate the milestone. Instead, I avoided the next chapter, which needs a major rewrite (another plotting issue), and then I started criticising myself for not being productive enough. I got stuck back in the same cycle. A week and a half ago my husband also took me into Royal Perth Hospital (at one in morning!) because I was in so much pain I couldn’t stop screaming. I was diagnosed with gastritis. The pain was worse than anything I’ve ever experienced. I’m still in pain a week a half later and I’ve been told I might need an endoscopy. What I’ve realised is how critical I’ve been of myself lately. I wrote a novel. I’m two thirds of the way through the first edit. I need to step back and remember to enjoy the process. It’s okay if it takes longer than expected. Aristotle defines a tragedy as having a beginning, middle and end saying, “tragedy is an imitation of an action that is complete, and whole, and of a certain magnitude; for there may be a whole that is wanting in magnitude. A whole is that which has a beginning, a middle, and an end.” (Aristotle, 350 B.C.E., para. 34). Gustav Freytag developed this into the pyramid model we are most familiar with today (1900, p. 115). Archer, J., & Jockers, M. (2017). The Bestseller Code. Penguin Books. Freytag, G. (1900). Freytag’s Technique of the Drama, An Exposition of Dramatic Composition and Art by Dr. Gustav Freytag: An Authorized Translation From the Sixth German Edition by Elias J. MacEwan, M.A. Chicago: Scott, Foresman and Company.